But I’ve seen posts from you that say that Jesus “taught” on gay and lesbians. And that from Luke 17:34-35, that God “accepts” gays and lesbians. But that is NOT what Jesus said. All Jesus said was “there are two men in a bed… two women grinding” (if you are correct). Jesus didn’t “teach” ANYTHING in these verses. Jesus didn’t say whether it was wrong or right. True. Jesus didn’t say whether it was wrong or right. What he said was that it didn’t matter, that it was irrelevant. It is the separation of the righteous and the unrighteous that is the key point of my thesis. The fact that some sexually active gays and lesbians are acceptable to God is the point I am making. The point of this passage is that homosexuality and homosexual activity are not factors in a person’s acceptability to God. God does not take sexual orientation into account. Jesus ignores it. -read more at « Bible-Thumping Liberal. This is how we know what love is: Jesus Christ died for us. And we, too, ought to lay down our lives for our sisters and brothers. If you have more than enough material possessions and see your neighbors in need yet close your hearts to them, how can the love of God be living in you? My children, our love must not be simply words or mere talk – it must be true love, which shows itself in action and truth. Love in this passage is portrayed in very down to earth terms. As Christ died for us so we ought to give our lives for others. Got more than enough to live on? Then share with those in need. Unlike those who only drone on about the virtues and beauty of loving we must love through our deeds. While not perfect, and far from being a cohesive entity, queer love mirrors what the writer of 1 John aims at. By virtue of being outcasts our “forbidden” love is a love of deeds. Queer love stands in the face of hatred. Queer love teaches in the presence of ignorance. 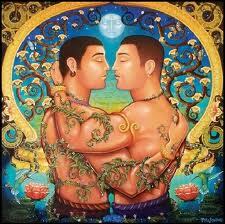 Queer love leads in the journey to liberation. If there is a special “role” for the christian queer in the contemporary church, or queers of other faiths, this may be it. Who better to rekindle the flame of active love in an aging and increasingly unfeeling institution? Who better to quicken the spirit of inclusivity? Who better to buttress the ramparts to the onslaught of injustice? Who better to name the sins committed against the fringe and the weak?